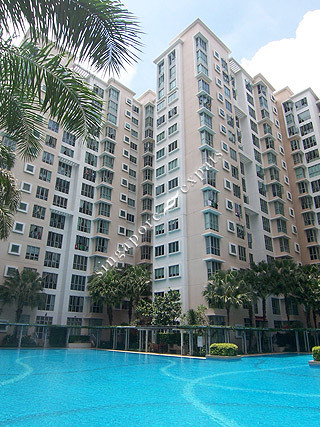 White Water is an executive condominium project located at Paris Ris Street 72, near the beautiful and scenic Pasir Ris Park, Elias Park and Changi Beach. Complementary to its name, water naturally is the main attraction at Whitewater. Apart from a spectacular foamy white water wall feature at the entrance, there are 4 pools in the condominium, including a 35m-lap pool, a fun pool, a jet pool and a swim-up Jacuzzi. What's more, there are many cozy niches and sunning decks where we can bask in the sun with peace and privacy. Add outdoor fitness stations, 2 tennis courts, a jogging trail, a playground, a foot reflexology path and indoor recreation facilities like a gym and steam rooms and you know why fitness fanatics like us love it here at Whitewater. White Water is a stone’s throw to the nearest Pasir Ris MRT station. Nearby amenities include Elias Mall, White Sands, Tampines Mall, Pasir Ris West Plaza, Century Square, Downtown-East Resort, The Japanese School Tanah Merah & Laguna Golf and Country Club. White Water is accessible via the nearby expressways - Pan Island Expressway (PIE), Tampines Expressway (TPE) and East Coast Parkway (ECP). It takes only 5 minutes or less to commute to the Changi International Airport. Beautiful condo with all amenities in walkable distance. Very nice for the single person who likes relaxed area, and who works at the East area such as Pasir, Ris, Expo and Changi airport.